The Game Developers Conference starts today. Here's what you need to know. For more than 30 years, the Game Developers Conference (GDC) has been one of the prominent events for displaying the most innovative video game technology to developers around the world. Each year, more than 28,000 developers gather for one week and learn about the advancements taking place in the video game industry and share the techniques and technologies shaping the future of gaming. This year, GDC will run from Monday, March 18 until Friday, March 22 in San Francisco, CA. In this series, we will cover the significant updates from GDC 2019 each day of the week and recap the conference after its conclusion on Friday, March 22. Even if video games are not the reader's specialty or not of particular interest, GDC 2019 will likely include many noteworthy announcements and innovations that will ripple far beyond video games. Regardless of background, it is essential to digest the wealth of information and transformative technologies that will emerge from San Francisco next week. Why? Video games make up a considerable part of the software market, generating $43 billion in sales in 2018 alone (up 18% from 2017). The influence of this sector also leads to many changes in related software markets, including artifical intelligence (AI), virtual reality (VR) and augmented reality (AR), cloud computing, and cloud streaming (e.g., Netflix, Hulu, game streaming, Games as a Service [GaaS], etc.). Many of the largest tech companies will be present at GDC 2019, conducting keynote speeches, tech-talks, discussions, Q&As, and live demonstrations throughout the week. These talks and presentations will incorporate game streaming, cross-platform gaming, AI, and VR/AR, as well as provide insight into the direction that these companies are headed in 2019 and beyond. Below is a list of the some the major companies attending GDC this year. 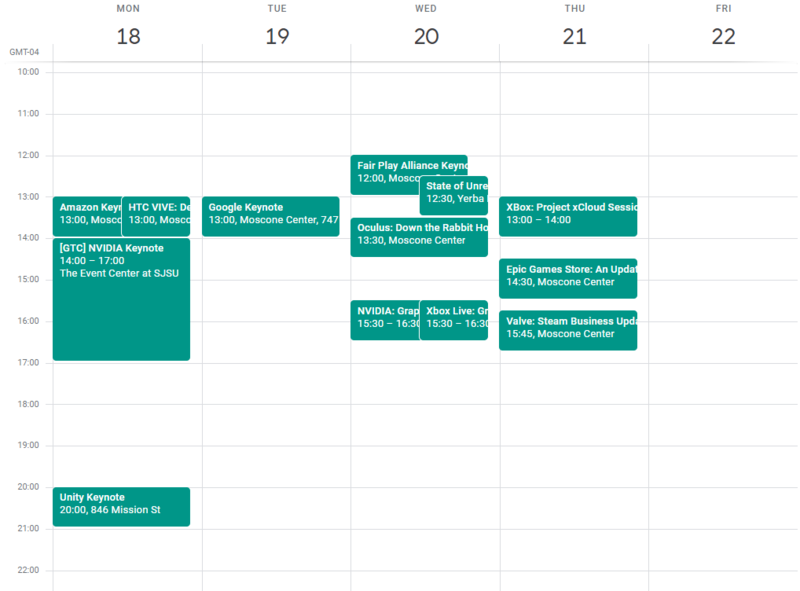 For a comprehensive list of companies joining the conference, see the official GDC schedule. 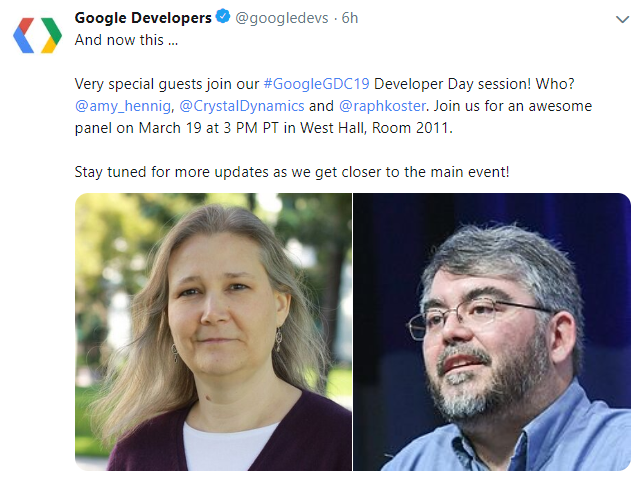 Google: Google is one of the most exciting names coming into GDC this year due to its rumored game-streaming service (see The Talk Going In below). The company will host numerous events throughout the week, but their keynote will take place at 1:00 pm EDT on Tuesday (Mar. 19). This keynote can also be streamed directly from YouTube starting at 1:00 pm EDT on Tuesday (Mar. 19). For more information, see the Google at GDC page. Google also posted a teaser trailer for its keynote that has gotten many excited that there may be some big news coming down the pike. Microsoft: Much like Google, there is a great deal of anticipation surrounding Microsoft's Project xCloud and its potential release of Xbox Game Pass to the Nintendo Switch (see The Talk Going In below). Microsoft will have numerous talks and demos during the week, which includes an Xbox Live cross-platform SDK demo at 3:30 pm EDT on Wednesday (Mar. 20) and a Project xCloud talk at 1:00 pm EDT on Thursday (Mar. 21). For the full schedule of Microsoft events, see the Microsoft @ GDC 2019 page. NVIDIA: Following up the launch of its RTX graphics cards in 2018, NVIDIA will be providing an update of its ray-tracing cards at 3:30 pm EDT on Wednesday (Mar. 20). This talk will cover the use of RTX technology in current and future games, as well as the company's plans for real-time graphics processing. Note that while GDC is going on, NVIDIA will also be attending GPU Technology Conference (GTC) in San Jose, where CEO Jensen Huang will be giving a 2-hour keynote address at 2:00 pm EDT on Monday (Mar. 18). This address will cover its work with autonomous vehicles, AI deep-learning and intelligent machines, IoT, and robotics. Coming off the heels of its acquisition of Mellanox, it will be interesting to see where NVIDIA plans to position itself in the cloud and AI markets. Amazon: The cloud-giant will cover computationally intensive gaming as well as how to grow a game on its popular game-streaming website, Twitch. The company's keynote, Video Games as Punk Rock: A History of Innovation, will be given at 1:00 pm EDT on Monday (Mar. 18). For more information, see Amazon's official GDC 2019 page. Valve: Valve will likely take the opportunity to push back against the Epic Games Store encroachment into the store-front market (see The Talk Going In below) and show-off why it thinks Steam has been and will remain top-dog in the fight. Valve will be providing a Steam Business Update at 3:45 pm EDT on Thursday (Mar. 21). Epic Games: Conversely, Epic Games will be making the case that Steam has fallen from glory. With many developers feeling negative about Steam's share of royalties (see The Talk Going In below), Epic Games is in a precarious position going in GDC to gain market-share—so long as they do not alienate gamers. Epic will be providing its Epic Games Store: An Update and Q&A at 2:30 pm EDT on Thursday (Mar. 21). For more information, including the time and location for talks on Unreal Engine, see Epic's official GDC 2019 page. Unity: Epic's main competitor in the game engine market will also be present at GDC, bringing with it significant announcements and never before seen technology. Unity will provide its keynote address at 8:00 pm EDT on Monday (Mar. 18). The Unity keynote can be also be streamed directly from YouTube starting at 7:30 pm EDT on Monday. HTC VIVE: VIVE has been a substantial mover in the VR gaming world, and it is looking to keep up its momentum in 2019. HTC VIVE will present its keynote address at 1:00 pm EDT on Monday (Mar. 18). For more information, see HTC VIVE at GDC 2019. Oculus: The veteran in the VR/AR market will present its signature talk, Down the Rabbit Hole with Oculus Quest, at 1:30 pm EDT on Wednesday (Mar. 20). This talk will include details on what Oculus takes into account when creating an immersive experience with their Rift and Quest product lines. For more information, see Pre-GDC 2019: Past VR Presentation Highlights. Apart from the above list, there will also be numerous other companies at the conference, including Sony Interactive Entertainment (the gaming and entertainment subsidiary of Sony of America), who will be hosting multiple events and talks throughout the week, and Nintendo—although Nintendo does not have any significant talks or events scheduled for the week. Nevertheless, Nintendo has a lot of excitement swirling around it, as we will see in the following sections. While there are dozens and dozens of major events taking place during the week, some addresses, such as keynotes, stand apart from the others. Below is a schedule of the principal events hosted by the above companies throughout the week. For a complete list of presentations at GDC, see the official GDC Schedule. For more information on VR-specific events during the week, see AndroidPIT. With so many large companies gathering in San Francisco, context about the current state of the gaming industry is essential. The gaming community is a very engaged and informed group, and in recent weeks, a few significant rumors have been floating around, including Google announcing a gaming console, Microsoft and Nintendo partnering up, Valve and Epic Games going head-to-head in the store-wars, and the increasing popularity of unionization in the game development circles. The inclusion of these two game developers hints that Google has something big up its sleeve for gaming. While all of this is speculation, the evidence is starting to mount, and if this rumor does turn out to be true, it will completely change the gaming landscape. Not only will the addition of such a monumental competitor shift the dynamics of the gaming industry, but this particular console may accelerate the move towards game-streaming and GaaS. IGN: Are You Ready for Google’s Streaming Console? It is no secret that Sony's PlayStation 4 (PS4) has thus far been the victor of this console generation, selling over 94 million units compared to 39 million Xbox Ones and 32 million Nintendo Switches. Even so, Sony's animus towards cross-play has allowed Microsoft and Nintendo to band together to take on the eighth-generation giant. Nintendo went so far as to create a Minecraft Cross-Play Trailer, simultaneously taking a swipe at Sony and looking buddy-buddy with Microsoft. Amid this collaboration, rumors have been swirling that Xbox Live and Xbox Game Pass may be coming to the Switch soon. This addition would be a monumental leap in the video game industry, as it would likely allow a large portion of the Xbox library to be playable on the Switch. While this would be an industry-altering move, there are some problems with bringing Game Pass to Switch. First, some of the games including in Game Pass already exist as native games on the Switch. This conflict could cause some legal concerns on the part of game developers (i.e., a developer may restrict Game Pass from allowing their game to be streamed on the Switch if it can be bought natively for the Switch). Second, if Game Pass and Xbox Live do come to Switch, where does that leave Nintendo Switch Online (NSO)? Many consider NSO to be lackluster in comparison to PlayStation Network and Xbox Live, so would Nintendo want a superior online service to exist alongside NSO? According to the grapevine, this rumor is likely to come to fruition, although the details of its implementation are still uncertain. It is also unlikely that Microsoft would announce this news at GDC: Being that Sony announced it would not be coming to Electronic Entertainment Expo (E3) 2019, E3 may be an opportunity for the two remaining console makers (namely, Microsoft and Nintendo) to pair up and share the spotlight with a major announcement. Regardless of when this rumor comes to fruition (if it does), GDC will play a critical role in this shift towards game-streaming and cross-platform play. The Xbox Live cross-platform SDK demo on Wednesday and the Project xCloud talk on Thursday, in particular, will provide great insight into where Microsoft is headed, and may even offer some insight into Game Pass being available on the Nintendo Switch in the future. There has been a not-so-nice competition between Valve's Steam and the Epic Games Store to be the top-dog in the video game store-front arena. To say that this war has turned ugly is an understatement. After announcing that Metro: Exodus would be exclusive to the Epic Games Store—and confusion ensued about the fulfillment of Steam pre-orders—fans review bombed the other games in the series in retaliation. Additionally, speculation has arisen that Epic Games Store also collects users' Steam information in a concealed manner, which has further detracted from Epic Game Store's consumer sentiment. More recently, Microsoft announced that the Halo: Master Chief Collection would be coming to PC, and in addition to being available on the Microsoft Store, would also be available on Steam. This news was a significant win for the Steam corner, but it is not the end of the story. As seen in the GDC: State of the Game Industry 2019 report, many developers are still not happy with Steam and think that Valve's cut of the game-revenue pie is too large for how little Steam provides. With this fierce competition as a backdrop, Epic Games will present its Epic Game Store: An Update and Q&A at 2:30 pm EDT on Thursday and Valve will show what it brings to the table in its Steam Business Update at 3:45 pm EDT on Thursday. Although not directly related to technology or software, there has been a tectonic shift taking place over the last few years in the gaming industry. While software and software development have tended toward open and unregulated management (i.e., open-source), it appears that recent stories of overworked game developers have brought up the idea of unionization. When one executive can get a $20 million bonus in exchange for crunching hundreds of people, shipping before the game is ready, the laying off those people, the industry is ripe for self-correction. While is it uncertain if workers in the game industry will eventually unionize, there is a roundtable scheduled for Thursday at 7:00 pm EDT to discuss unionization. If the gaming industry does decide to unionize, it will change the nature of software development and has the potential to spread further than just game development. Year after year, PC has consistently been the platform of choice for game developers. This dominance is unsurprising. Creating games for the PC is a natural feature of most game engines, PCs allow for unlocked framerates, and the hardware available for PCs means there is a large upper-bound for performance. According to the GDC: State of the Game Industry 2019 report, 66% of developers are currently developing games for PC, while 38% are developing for smartphones and tablets, 31% are developing for PS4 and PS4 Pro, 28% for Xbox One and Xbox One X, and 18% are developing for the Nintendo Switch. Interestingly, when polled about the platform that most interests developers right now, the Nintendo Switch jumps out in the console race, with 45% of developers saying that they are interested in developing for the Switch. The PC still commands the lead with 60%, but PS4 and PS4 Pro pull in behind the Switch with 38%, smartphone and tablets follow up with 33%, and Xbox One and Xbox One X fall behind with 28%. With the rise of the Nintendo Switch since its launch in March of 2017—on the heels of the disastrous Wii U lifecycle—Nintendo may have earned its place back with the big boys (e.g., Sony and Microsoft). What's more, Nintendo has successfully positioned the Switch to be one of the most successful consoles in the current generation—and will likely give the PS4 a run for its money for the top spot. With Nintendo's release of AAA games such as Pokemon and Animal Crossing in late 2019, the possible announcement of ninth-generation consoles by Sony and Microsoft in 2019 and 2020, and the foreseeable inclusion of Google in the console market, the world of gaming is about to experience a shake-up for the remainder of the year into 2020. This series will cover each day of GDC 2019, releasing a new article at the end of each day, capturing the events of that day and what they mean for developers. With so much talk (and hype) going into this GDC, there will likely be a lot to cover and even more to analyze. The goal of this series is to bring to the most pertinent information to the reader in a concise but exciting way and provide avenues for obtaining more details throughout the week.